1. Put the eggs in a small saucepan, cover with just-boiled water from the kettle, set over a high heat and simmer for 9 minutes. Drain and rinse under cold water to stop the cooking, then set aside. 2. Heat a griddle pan over a medium-high heat. 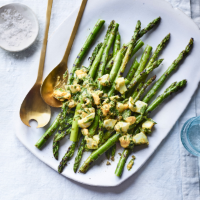 Trim and discard the ends from the asparagus then toss in a mixing bowl with ½ tbsp oil; season. Lay in the pan and cook, turning regularly, for 5-7 minutes until tender (adjust the time according to thickness); set aside on a serving plate. 3. While the asparagus is cooking, make the sauce. Peel the eggs, then halve one of them and remove the yolk. Using the back of a fork, mash the yolk in a mixing bowl (you can use the same one that you tossed the asparagus in) then whisk in the vinegar and mustard. Slowly drizzle in the remaining 4 tbsp oil, whisking as you go to emulsify the sauce. Chop the egg white and the remaining 2 eggs. Fold through the dressing along with the capers and herbs. Check the seasoning, spoon over the asparagus and serve immediately.